Dispatch is compatible with IMAP-based email accounts, and has been tested to work with email accounts from Gmail, Google Apps, iCloud, AOL, Yahoo!, FastMail, QQ.com, GMX.com, Openmailbox.org. Users have reported problems with the following services: Office 365, Outlook.com, Live.com, Yahoo Business Mail, Dreamhost. We do not recommend buying Dispatch if you're using any of these services. Other mail servers will require you to provide additional information—such as the IMAP and SMTP addresses, port numbers and authentication methods—or may fail to work altogether. Dispatch does not support POP and Exchange email accounts, and we have no plans to support them. Dispatch is compatible with any iPhone, iPod touch and iPad running iOS 8 or later. No push notifications (and no plans for them). We support iOS Background App Refresh to fetch emails in the background. The fetch intervals are not regular and are determined by iOS. As of version 1.3.9, Dispatch supports a total of 31 apps that you can triage your mails and its contents with: 1Password, 2 Days, Appigo Todo, Asana, Calendar, Chrome, Clear, Dolphin Browser, Drafts, Droplr, Due, Evernote, FaceTime, Fantastical, Fantastical 2, Finish, Google Maps, Google Translate, HockeyApp, Instapaper, Maps, Message, OmniFocus, Pocket, Readability, Reminder, Safari, Skype, The Hit List, Things, Twitter. There are currently no plans for Dispatch on Android or other platforms. You can activate the 'Archive', 'Move' or 'Delete' action either by tapping on them, or sliding them towards the left. If a 'Quick Move' folder has been configured for an account, sliding the 'Move' icon towards the left moves the mail to the 'Quick Move' folder immediately. 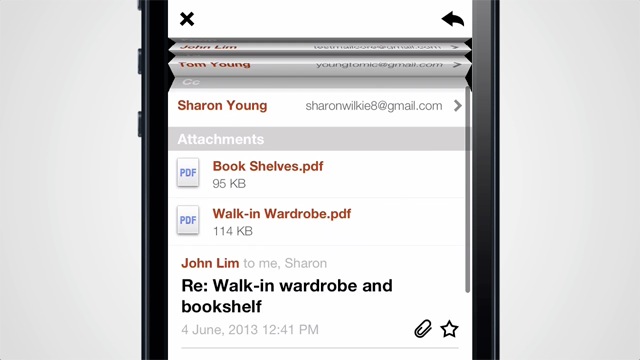 A longer swipe across the mail triggers the Quick Action, which archives the mail by default. 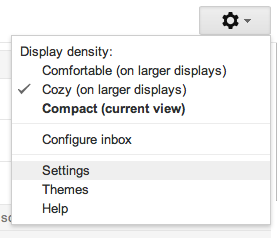 This can be configured to 'Mark as Spam' or 'Delete' in Settings. 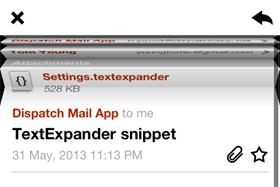 TextExpander snippets can be imported into Dispatch for use. TextExpander fill-ins and date/time functions, however, are not supported when imported as Dispatch snippets. Email the .textexpander file you'd like to import to an email that is already setup in Dispatch. Wait for the mail to arrive in the account, and tap on it to read it. Pull down to reveal attachments in the mail. Tap on the .textexpander attachment and wait for it to be downloaded. 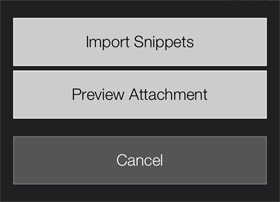 Select the snippet groups you wish to import and tap 'Import'. If you're using Google's 2-step verification, you may find yourself unable to sign in to your Gmail or Google Apps account in Dispatch. Follow the steps in Google's Sign in using application-specific passwords to generate an application-specific password for use with Dispatch. If you're unable to archive or mark a mail as spam, refer to the question Unable to archive or mark mail as spam. If you're using Gmail or Google Apps and you experience a problem where deleted mails end up in your All Mail folder, refer to the question Unable to delete (Gmail and Google Apps). The 'Archive' and 'Mark as spam' button moves the mail to a folder on your mail server. If you find either of them disabled when you swipe left across a mail, you may need additional configuration in Dispatch or in the web interface of your email provider, or both. Login to Gmail or Google Apps Mail with your desktop web browser. Click on the gear cog near the top right and select 'Settings'. Click on 'Labels' near the top. Ensure that 'Show in IMAP' is checked for 'All Mail' and 'Spam'. Quit and relaunch Dispatch and wait for refreshing to complete. Swipe left across a mail to see if the 'Archive' and 'Mark as spam' buttons are enabled. If not, follow the instructions on 'Configuring archive and spam folders in Dispatch'. Access the menu in Dispatch by tapping on the top left button or swiping towards the right. Tap on 'Settings' at the bottom of the menu. Tap on 'Accounts' at the top. Select the email account that has its 'Archive' or 'Mark as Spam' button disabled. If 'Archive Folder' is reflected as 'Not configured', tap on it and select the appropriate folder to move a mail to when archiving an email. If 'Spam Folder'' is reflected as 'Not configured', tap on it and select the appropriate folder to move a mail to when marking an email as spam. If the 'Delete' function does not move the mail to your Gmail 'Trash' folder, but leaves it in the 'All Mail' folder, follow the instructions in Configuring Trash folder in Gmail or Google Apps. Ensure that 'Show in IMAP' is checked for 'Trash'. To better help us diagnose the issue, please let us know the steps taken to reproduce the crashes, and if possible, send us the crash logs as well. To find the crash logs, first sync your device with iTunes. Then follow the instructions to obtain your crash logs. You may find a number of crash logs under the names 'Dispatch_YYYY_MM_DD_YouriPhoneName.crash'. You can zip them up and send it over to us if you find any. While you can access every menu and function in Dispatch with buttons, you can also navigate around the app by swiping. Swiping right from any screen brings you back to the previous page. If you're in an Account, the Settings or the Snippets page, swiping right brings up the menu. While composing a reply, you may find it helpful to swipe back from the composer to read the mail or to quote portions of the mail in your reply. Before version 1.2, Dispatch included a message:// link when creating reminders/tasks in apps like Due, OmniFocus, Things, etc. 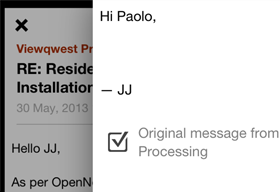 These message:// links allow you to associate the reminders/tasks with emails from which they were created from, and could be used to open the mail in Mail.app or Sparrow on the Mac. We had planned to support opening these message:// links in 1.2, but Apple registered the scheme for their own Mail.app in iOS 7. While the iOS 7 Mail.app could open these message:// links that we've included previously, it does not open emails that are no longer in your inbox (ie. links pointing to emails that have been archived won't work). Thus, we decided to replace the message:// links that we've been including with our own x-dispatch:// format, which allows you to open these emails in Dispatch. Unlike Mail.app, Dispatch can also open messages that have been archived. However, using our own x-dispatch:// format means that you can no longer open these links on the Mac. To workaround this problem, we made a helper tool that redirects these x-dispatch:// links back to message:// links on your Mac. This helper tool has no interface and neither appears in your Dock nor menu bar. You can install the helper app by dragging it to your /Applications folder, and launching it once. To remove the tool, drag it to Trash. Dispatch does not use any intermediary servers to connect your device to your mail server; your device connects directly to your mail server to fetch and send email. Because of that, we do not store your credentials anywhere else besides in the secure keychain of your device. Your credentials are never transmitted anywhere else besides to your own mail server for authentication. We use Hockey App for crash reporting, and Dispatch automatically sends us crash logs that do not contain any personally identifiable information after a crash. However, if you have turned on diagnostic logging in Dispatch settings, these crash logs will contain information that may be personally-identifiable, including your email address(es) and in some cases, subjects of your emails. Diagnostic logging is disabled by default and should only be enabled when advised by us, and only if you are comfortable to do so. © 2013 Clean Shaven Apps Pte Ltd.
Sign up for the latest scoop on Dispatch and our other products in the pipeline.